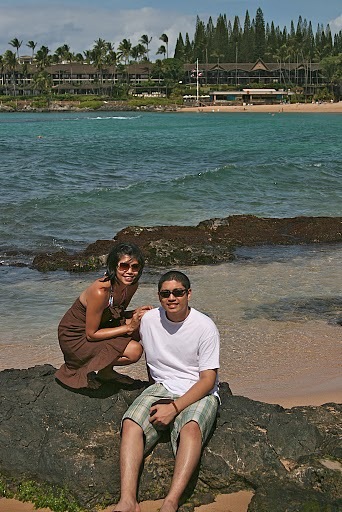 My son, Tristan, and I on our Maui trip in 2008. Guess who looks like they're having so much fun? Today my youngest child, my son, turned twenty-years-old. I experienced a multitude of emotions but as I reflected on the past twenty years I realized that a mother's love is an equal mixture of pain and love. 50% love for an only son that I am incredibly proud of and 50% pain from the longing I have for us to be closer. We used to be best buds, he and I, but as it is with all mothers we have to pass the proverbial ritual of letting go. Mama's boys are not attractive and this I know from experience. 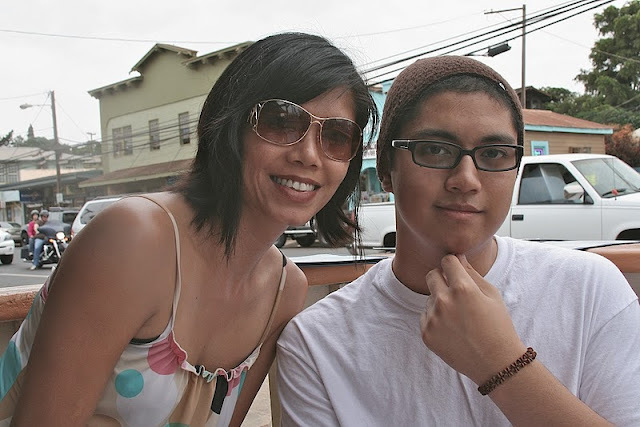 But during the letting go process I made mistakes, some monumental, that drove a wedge between my son and me. These mistakes haunt me in the middle of the night like spectral images behind my closed eyelids. I can't pinpoint the exact moment when our lives shifted and we transitioned into strangers. Lately, the moments we spend together have a distinct air of acquaintances being forced to interact with each other and I wonder if the sound of my breaking heart penetrates the wall he's put up between us. I'm often told that all twenty-something year-old sons act distant and will eventually come to their senses. As I patiently wait I try not to punish myself by accepting penance. Do all mothers experience this torment? When I learned that I was pregnant with Tristan I was twenty-three years old with two little girls in the toddler stage and suffering in an abusive marriage. I could have chosen to take the easy way out and decided to be rid of the baby but that wasn't my style. I took responsibility for my actions and faced the consequences but I mentally denied that he was growing inside me. And maybe it was the ambivalence I carried along with my unborn child for 9 months that led me to this time of penance twenty years later. Everyone told me my third pregnancy would be easy and quick, that labor would be a piece of cake since I've already given birth twice. Stupid me believed them. But Tristan proved them wrong when he was the longest, most difficult, and extremely painful birth. Even then I felt I deserved it and refused pain medication as a sick form of self-flagellation. Lame, I know. The night he was born I held him in my arms and wept for hours asking him to forgive me. Tears saturated his newborn skin running in rivulets down his chest and creating pathways of my pleading to his little heart. "Forgive mommy's stupid selfishness and pride, I will make it up to you the rest of your life. I promise. Just please forgive me." It is the same refrain in every mother's heart whose abiding love for her son forces her to face mistakes with contrition. I refuse to give up and will continue to build a bridge of hope and redemption with painstaking care from my heart to his. I am holding on to the belief that one day he will realize that even though I'm not the world's perfect mom the love and respect I have for him are. And a mom's perfect love and respect for her twenty-year-old son are invaluable compared to the iPhone 5 he asked for. Happy Birthday, Trey! Since I don't have videos of my kids I spent my quiet time of reflection today by perusing pictures from our Maui trip in 2008. Only two of my kids were able to join me but I'm grateful that Tristan was there to make memories. Watching my children grow makes time appear ethereal. 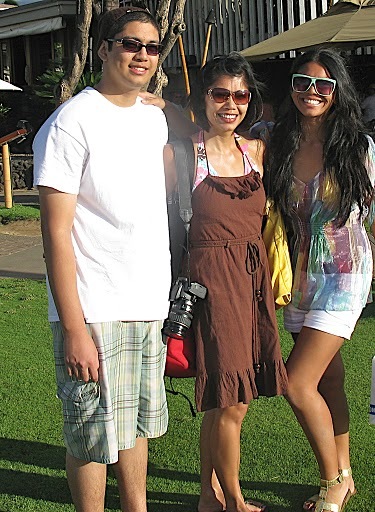 Tristan with his sister Maricelle and I. My gentle giant. 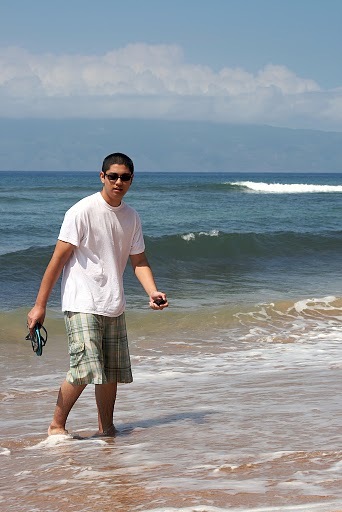 He refused to venture out and enjoy the beach with us until our last day in Maui which makes this photo priceless. Another priceless picture with Tristan. He's smiling. Mom loves you Trey. Maybe next time YOU can take your old mom on a vacation! HA!